← McAleer & Rushe Group: Asleep on the Job – or are Liabilities Forcing an End Game? Westminster City Council turns a blind eye to British Land. 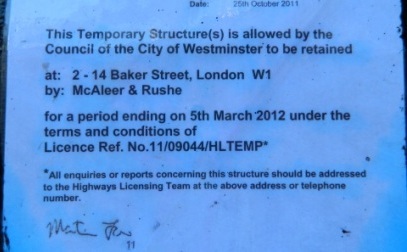 Temporary structure licence on display on 30th May 2012 oattached to illegal temporary structure at 2-14 Bake Street (also known as 10 Portman Square). And this despite the licence having expired on 25th March 2012 – two whole months ago. Expired licence is attached to the temporary structure that is blocking a public highway (Robert Adam Street leading to Baker’s Mews) and which is still in place – with no penalty or enforcement by Westminster City Council Street Licensing. Don’t F with the big boys attitude. Park without paying in Westminster, even for a few minutes, means instant fines and worse. At least if you are Joe Bloggs. Step out of line on planning regulations in Westminster and wham – BIG BIG trouble. Block a whole road illegally – or pull down a major building with no dust or particulate containment and it’ll be back to the days of the dungeons. Prison – for a loooong stretched out time. Pour wet concrete over the fence of a building site – repeatedly and onto people and property on Westminster’s public highways? Shudder – it’ll be ‘off with your head’. Ignore ALL regulations and stick two fingers up at everyone – and then again with the other hand….. Chop! Westminster City Council would see you as a very very bad person. One to be eliminated from the boundaries of the City of Westminster. Banished, with no food or drink. Horse and all. Unless you are British Land, that is. Yes, the very organisation who seem to view itself as the real monarchy of Britain. The organisation whose poetic ‘Uncle Bim the Board Man’ sings like a true song bird – a true song of power and influence. A song of strength and greatness. Company and Self, no less. Yes, if you are British Land, the evidence points to you being allowed by Westminster City Council to do as you please. Get your contractors to play the thug to residents of Westminster and that’ll be an extra pat on the back. Sir! Yes, don’t forget the ‘Sir’. F the bloody residents. F Joe Bloggs and Mary Bloggs and the little ones. F them all, in fact. Who cares? A few injuries or deaths or a few more cars written off is no bad things, after all. Yeah, Westminster City Council and British Land are Buddies. Best of Buddies, in fact. Don’t mention the graft. Don’t mention that at all. No Sir, not a word. Promise! Cross me heart and all that. McAleer & Rushe? Yeah, we’ll turn a blind eye there too. They’re best of buddies of Uncle BIM the Board Man, after all. Family, like. Got to be protected. Uncle Bim’s got £30m riding on that friendship, after all. Yeah, I remember, don’t mention the graft. Not at all. Not even once. Forget that word. F NAMA and all that. Cross me heart again, and again, and then again again. No, don’t know what that £30m is about. Not a word of it. Old Uncle Bim and his gang had a good Bim Brag about it all the same to a bunch of Analysts. That’s Analysts with a Capital ‘A’. Important people, not that other type of ‘A’s. Yeah, and all that. But back to Westminster City Council. If you are Joe Bloggs or anyone even distantly related – yeah, there’s the considerate builders thing. There’s all those regulations and legislations. Don’t screw up. Do it right or BANG, that’ll be you gone. Apply for all the right permits. Don’t start ahead of the permits. Consult, consult and consult. Consult with everyone. Follow the rules. Don’t cut corners. Don’t take shortcuts on Health and Safety. Whatever you do, DO NOT BLOCK THE ROAD – EVER. Don’t be rude to ANYONE. Thuggery is a BIG NO-NO. This is Civilised Society. Behave at ALL times. BUT, BUT, BUT. None of that applies to British Land or their cronies. Bed buddies especially. Yeah, if British Land want to have illegal structures with no permits that’s fine. BUT if it’s anyone else we’ll screw them. Screw them good, in fact. And so the site at 2-14 Baker Street – also known as 10 Portman Square – EXEMPT. Exempt from everything. No site perimeter fencing for the first nine months when there’s dust and possible asbestos flying everywhere – yeah, no problem. Naughty, but ok. Keep a temporary structure AFTER its licence has expired? Yeah – that’s ok too. No problem about the road being blocked off with no permit. F the residents anyway. Public right of way from Baker’s Mews to Robert Adam Street? F that as well. In fact F everything. Yeah, pump that concrete over the fence – children, women, who cares. Target that bastards car – and ‘job well done’. In fact, do it again, and then do it to a few more resident’s cars. F the lot of them. The Council doesn#t care and we will turn another blind eye. How many blind eyes do I have? Graft? That’s nothing to do with blind eyes. Yeah – lets British Land, McAleer & Rushe and Westminster City Council sit down and figure out how we can go to WAR on the public in Westminster. The less of them the better. F the lot of them. It’s US and US, after all. Within just one day of Westminster City C0uncil being asked to explain why this construction site at 2-14 Baker Street (10 Portman Square) is allowed to maintain temporary structures without licence and closing off public highway and footpaths, and one day after this article being published, it seems Westminster City Council have rushed through a new temporary structure licence! Considering the comments of Mr Kennedy on the 31st May as reported in the legal notes below, why the sudden great rush to ligitimise what has been an illegal structure? This article includes factual information relating to the operation of and site management at 2-14 Baker Street (also known as 10 Portman Square) and the position of and information from Westminster City Council. It was confirmed in a phone call with to Mr Joe Kennedy in the Street licencing team at Westminster City Council that the construction site has no current licence for the temporary structures surrounding the site. This conversation took place on 30th May 2012 – over two months after the licence displayed in this article expired. No new licence has been issued and the structures, including the closure of the roadway from Baker’s Mews to Robert Adam Street are therefore not authorised. Westminster City Council have taken no action. Indeed, Mr Joe Kennedy explained the Council’s position – he stated and agreed that the site is required by Law to ”have a current valid temporary structure licence displayed on the site”. However he also stated, when asked whether they would take action for the failure to have such a valid licence, that Westminster City Council would not seek to enforce the failure to have a temporary structure licence. He justified this by stating that there is a big difference between erecting a new structure (without a licence) and having an existing temporary structure without a licence. So there you have it. If you are in breach of any condition or regulation in Westminster and can show that you have been doing this previously – that, according to Mr Kennedy at Westminster City Council, would appear to be sufficient grounds to avoid prosecution. During the conversation with Mr Kennedy he huffed and puffed – not at all sounding like the wolf in ‘Little Red Riding Hood’. No, this was huffing and puffing because he clearly felt that British Land and their contractor, McAleer & Rushe, should be given free reign. Mr Kennedy also stated he has a busy workload and displayed impatience in having to spend time discussing why this site is seemingly above the law and is being afforded preferential treatment. FOr a public servant to audibly huff and puff when dealing with a member of the public is clearly not acceptable behaviour and calls into question Westminster City Council’s whole attitude in its dealings with British Land and their site at 2-14 Baker Street (10 Portman Square). The developers of the site at 2-14 Baker Street (10 Portman Square) have contributed materially to Westminster City Council by way of Public Realm Works. This article sets out a position that there is improper response by some sections of Westminster City Council in its dealings with British Land and British Land assets – specifically in respect to several breaches of regulations on the site at 2-14 Baker Street and including where there is substantial danger to the public, where property has been damaged, where conditions have not been adhered to and where unsafe and improper practices on the site are supported by video, photographic and other recordings. This article makes no claim whatsoever that any improper payment of funds have been paid to any party mentioned in this article. This entry was posted in 10 Portman Square, 10 Portman Square l W1, 10portmansquare, 2-14 Baker Street, Bank of Ireland, Boris Johnson, British Land, Building Site, Child Safety, Children, children's playground, Commercial Development, Competition, Congestion Charging London, Construction, Construction Deaths, Death, Disabled Access, Free Parking, HSE, Ireland Construction News, Legal Action, London, London Mayor, London Olympics, Mayor of London, McAleer & Rushe, McAleer and Rushe, Mob, NAMA, NAMA Wine Lake, NAMAWINELAKE, Parking in London, Retail Development, Street Parking in Marylebone, Street Parking in Westminster, Tax Avoidance, Thug, Thuggery, Tourism London, UK Construction News, Uncategorized, West End, Westminster, Westminster City Council, Where to park in London, World War III and tagged 10 Portman Square, 2-14 Baker Street, Baker Street, Bank of Ireland, Boris Johnson, British Land, Business, Central London, Children, City of Westminster, Company, Considerate Builders, Construction, construction site safety, Danger, Death, Health and Safety Executive, HSE, Ireland, Joe Blogg, London, London Olympics, McAleer & Rushe, McAleer and Rushe, National Asset Management Agency, Occupational safety and health, Portman Square, public hazard, Robert Adam, West End, Westminster, Westminster City Council. Bookmark the permalink. 1 Response to Westminster City Council Bends the Rules for British Land – Who says Graft is Dead?